Are You Making These 6 Lead Nurturing Mistakes? Lead nurturing…all the cool kids (in this case, successful marketers) have a lead nurturing approach in place, right? After all, as many as 75% of leads aren’t ready to buy and it is up to marketing to help them along their buyer’s journey until they become real, paying customers. Seems like a no brainer. Lead nurturing is the way to go. Just last week I was having a conversation with a former co-worker. She was talking about her company’s recently implemented lead nurturing approach and how excited they were about it. I was glad to hear they were thinking about their leads this way. However, I walked away from the conversation wondering if their approach was going to leave their leads feeling nurtured or spammed. The phrases that stand out to me are care for and encourage the development of. 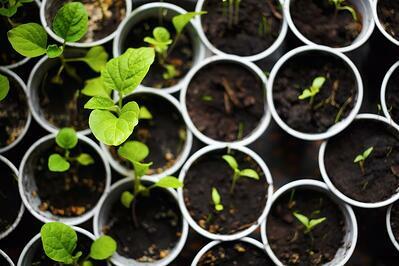 When I think about lead nurturing, I imagine our leads as tiny plants…just poking through the ground. If they were really plants, they would need a certain amount of sun and water to thrive. They would also need to be protected from cold and from storms. And above all, they would need constant care and attention. Obviously leads are not plants but to nurture them means the same thing…care for and encourage the development of. Now think about your lead nurturing approach. Does it feel like what I’ve described above? Do you really care for and encourage their development? When my friend described the approach her organization was taking to lead nurturing, care and encourage did not come to mind. Considering that 98% of all marketing qualified leads never turn into customers, I’m betting hers is not the only one. Here are six mistakes that can lead to poor lead nurturing results. If you are doing any of them, it is time to rethink your approach. Perhaps the single, biggest lead nurturing mistake B2B marketers are still making today is not nurturing their leads at all. While it may sound hard to believe, there are still many small and mid-size B2B companies out there without any kind of lead nurturing strategy in place. Ignoring your leads or turning them directly over to the sales team is the opposite of nurture. It's like not taking care of them at all. If you expect those leads to ever turn into customers, you need to develop them. Leaving your leads to figure things out on their own is a huge mistake. It's like leaving money on the table. An email blast is not lead nurturing. How much do you care about your leads if you send them all the same message, at the same time, on the same interval, month after month? After all, your leads are not likely to all be in the same phase of the buyer’s journey. They probably represent multiple personas. Their problems are all slightly different. What can you possibly “blast” at them that is going to leave them feeling cared for? They will feel spammed. I’m sure you’ve experienced this personally. You download something from a site and before you know it, you’re now part of an email blast. You start receiving information that isn’t even relevant to what you originally downloaded. You’re receiving an email blast and you opt out as soon as you can. Don’t be that company. Remove email blast from your vocabulary. So when someone downloads something from your site, what happens next? They probably receive a thank you message either immediately or via email. They may also see the link to their download immediately or they receive that via email. Whatever the case, simply sending a thank you message is not lead nurturing…even when it includes offers to the next logical piece of content. My former co-worker described this scenario to me as “lead nurturing.” This is not lead nurturing. It is simply a door opener to lead nurturing. Don’t stop sending thank you messages just realize that it is really not lead nurturing. You can’t water a plant once and expect it to survive, can you? How many buyer personas do you have? (If you haven’t defined your buyer personas, that’s a completely separate issue you need to address before you worry about lead nurturing.) If you’re like us and many of our clients, you have at least two and probably three. The problems you solve for each of them have their own nuances. The way you talk to each one is different. Why then, would you put all of them into the same lead nurture workflow? One of the keys to effective lead nurturing is segmentation. There are many ways to segment. You can create lead nurtures by buyer persona, by where the lead is in the buyer’s journey or a combination of both. The possibilities for segmentation are unlimited. The key is to be as specific as possible. Effective lead nurturing requires segmentation. It is better to have 15 lead nurture workflows each with 50 leads enrolled than it is to have one workflow with 750 leads enrolled. You wouldn’t care for a cactus the same way as a tomato plant, would you? If you’ve done a good job segmenting your leads, you probably have several lead nurture workflows created. You may be tempted to enroll each lead in multiple workflows. For example, you could put someone in the buyer persona A workflow and then add them to the consideration phase workflow. Before you do that, remember the reason for segmenting is to be able to deliver relevant content to that particular group of leads. If you enroll someone in multiple workflows, you open the door for confusion and they may feel like they are being spammed…not nurtured. Just like a plant…you can over water it. Email is a great place to start with lead nurturing. However, with declining open rates, it probably isn’t a good idea to put all of your eggs in one basket. Multi-channel nurturing, while more complicated, can lead to better results. Incorporating social media, paid retargeting, dynamic website content and sales development efforts (with your email approach) can yield better results. That’s right…I said sales development. Adding outbound to your lead nurturing approach can have a significant impact. Remember, we are caring for and encouraging the development of our leads. Real human interaction can go a long way in achieving just that and making our leads feel like that is our intent. Word of caution…before you start a multi-channel lead nurture, make sure your sales and marketing teams are fully aligned and working as one demand generation team. If they’re not, a multi-channel approach could do more harm than good. Leads are something that we, as marketers, need to take care of…like plants or small children. Take the time to develop a lead nurture program that really does that and you will reap the benefits.